The drive to Laurel’s orthodontist appointment on this sunny summer morning was pleasant enough. We chatted amiably and even prayed together. The drive home? Not so much. By the time we turned into the driveway we were hardly speaking to each other. This was Laurel’s first time getting her braces tightened. (Or adjusted. Or whatever it is they do to braces these days.) The assistant wasn’t the most gentle, and before we even left the office Laurel’s teeth were already sore. She was also disappointed that her braces were minus the colored elastics she was hoping to sport for her upcoming birthday. (This may sound minor. Let me assure you, as the mom of a 12-almost-13-year-old, that it is not.) Physical pain plus emotional let down is a bad combo. When my children are hurt I don’t handle it well. I often react by getting angry. Not at them, but at the situation, and my lack of control over it. (Of course, they don’t know the difference.) I also have a low tolerance for complaining. The kind which commenced immediately upon exiting the orthodontist’s office. Another bad combo. Add to all of this an adolescent girl and one menopausal mama and you’ve now got yourself a really bad combo. A hormonal hurricane. The perfect storm. Our emotions and voices began rising like an incoming tidal surge. Before we even knew what had hit, “Tropical Storm Smith” had made landfall and was swirling around us. Words pelted. Tears fell. Upon arriving home we quickly retreated to separate rooms to recover and regroup. I attempted to process the emotionally charged exchange that had just occurred. A common denominator stood out to me: Pain. When we are hurting, either physically or emotionally, conditions are ideal for a storm to develop. I also recalled reading a few years ago that hurricanes need fuel, in the form of moist, warm air, to survive. Laurel’s frustration and my anger added the necessary fuel components. Next thing we knew we were caught up in unexpected, heated conflict. Jesus knew a thing or two about storms. 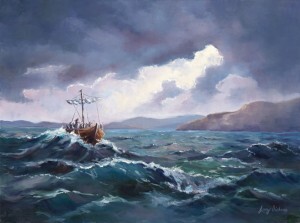 To this day, the Sea of Galilee is notorious for sudden storms that can spring up out of nowhere. Jesus and His disciples were threatened by such storms on more than one occasion. Only they never caught Him off guard. Thankfully, He also knows a thing or two about calming storms. I asked Him to settle my heart and restore peace to my relationship with my daughter. We offered and accepted apologies and shared hugs. We were able to discuss what had happened, and why, and how we might prevent it from escalating out of control in the future. It isn’t always smooth sailing in relationships. Storms sneak up. Conflicts come. Hormones wreak havoc. But we don’t have to end up a shipwreck. With His help we can seek to understand our reactions, learn from our mistakes, and take steps to avoid repeating them. Ahh, the sweet calm after the storm.